Green Goddess Gardening is a small family firm offering a personal, professional and hands on approach, while our low overheads and business running costs allow us to offer very compettive prices. 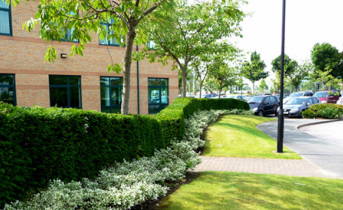 We service all commercial green space including: Private Gardens, Communal Green Space, Car Parks, Industrial Estates, Public houses,Hotels, Property Agents, Commercial properties etc. Whether your running a business or selling the property itself, presentation is the key to making the most of your assets. Any space can be improved dramatically with even the simplist landscape scheme to complement it. We can landscape, renovate or maintain the exterior of your property to keep it looking attractive all year round. We offer a complete year round maintenance service including: lawn care, planting, pruning, feeding, weed control, winter snow clearance, grit applications and all other related work. We are fully equipped with petrol and hand tools and chemical spraying equipment and hold publc liability insurance. If your request a free quotation we will discuss your requirements with you and come up with a seasonal maintenance plan for the year ahead along with a health, safety and risk assessment of the proposed work. Click here to fill in a short form with the details of your enquiry and we will get back to you as soon as possible.